Josep Pujal Curià is an enthusiastic engineer working on the TSC's TV and Multimedia lab since 2009. He receive a bachelor in Telematics Engineering in 2004, a Telecommunications enginner degree and a Master of Science in Telecommunication Engineering & Management (MASTEAM) in 2008 at EETAC. 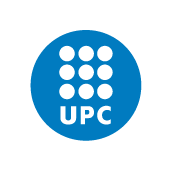 He started working for the UPC in 2002 at EETAC's IT services and he currently collaborates as a HPC systems administrator at INTE. He collaborated with i2Cat Foundation during 2008 and 2009.